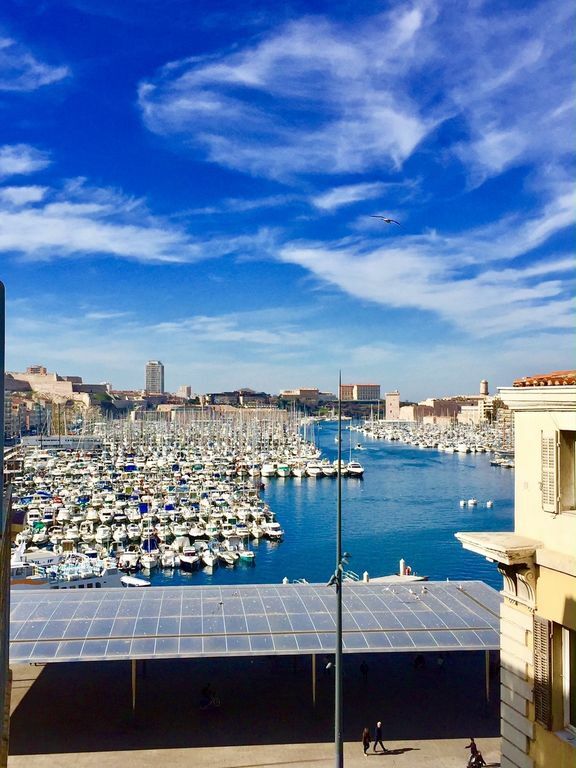 Spend your holidays or business trips in a fully equipped high-quality apartment in the Vieux Port (old harbor) the heart of the historic center of Marseille. On the street side, a long balcony overlooking the port with French door access from the living room and the master bedroom. Courtyard side, a large South-facing terrace with flowerbeds, partially covered to house a table for 6. Double glazing. Air conditioning. Lift. Near the sea, beaches & calanques, museums, restaurants, shopping areas, places of entertainment and culture, with bus/metro/shuttle boras on your doorstep. Brilliant location in centre of Vieux Port. The apartment is superbly situated within one minute of Vieux Port. Shops, boulangerie, restaurants, metro and buses all within a short stroll. The apartment is very clean, comfortable with lovely outdoor roof terrace for meals. Roland, the owner, was very helpful, (speaks excellent English!) and could not have done more to ensure we had a great first holiday in Marseille. Would certainly return in future! We thoroughly enjoyed meeting you as well. If only your stay had not been bookended by demonstrations... ! We thank you for your lovely comments about our apartment, our assistance and very much look forward to having you both stay with us in Marseille again! Superbe endroit dans le coeur de Marseille. Nous avons adoré notre séjour, l'appartement était en tout point conforme à la description. L'endroit est tout simplement magique, la vue du port est vraiment de toute beauté et la cour intérieure nous permettait de petit déjeuner en toute tranquillité. L'appartement quoi que dans le coeur de l'action est très tranquille. Roland nous a donné de bonnes informations pour visiter Marseille ainsi que l'arrière pays. Je recommande définitivement cet endroit, très bien situé pour visiter la ville et facile d'accès, si comme nous vous avez une voiture. Notre seul regret.... notre séjour était nettement trop court. Merci pour vos commentaires élogieux. Je suis d'accord avec vous qu'en de telles circonstances un séjour parait toujours trop court! Et cela s'y remédie facilement en revenant. Nous serons ravis de vous recevoir de nouveau. .Very spacious, lounge well equipped,side balcony with great views to harbour.Great evenings sitting watching boats,not enough space for chairs but sitting on step ok.
Tv and cable,dining table,comfy sofa,stereo.Kitchen very well equipped.Halogen top , full oven,microwave,coffee maker.Double doors to outside roof terrace.Very spacious.large table and chairs.Also washing machine in outside cupboard.We used it twice .Drying rack.Drying made easy .Lovely to eat there..Great artisan bakery across the road.Fresh baguette every morning. Bedroom very spacious.,comfy bed.plenty of storage.Double doors out to narrow balcony with views to harbour. We felt extremely safe staying here.2women.Street door had lock,then external door with key, then lift.then key to apartment.Bathroom very spacious.shower cubicle.separate toilet.iron and board. Lots to do in Marseille.We did lots of walking to a all area's.Took th ferry to Freile island.lovely.peacful.had lunch.8 Euro for ferry .fab. Also they have a little train again just outside apartment , 2 routes .1 to cathedral and 1 to panier.8 Euro..But it is all walkable.Fisherman arrive every morning on the harbour.just opposite. We are so appreciative of the time you took to post your very detailed feedback and for the quality of your fantastic comments! It is also bound to be very helpful to other guests. Meeting you two was a delight. a 10 out of 10 encounter! We can only hope that this first stay in our apartment will only be the first of many more to come whenever you choose to spend time in Marseille. When you come again, we can suggest other day trips so you will keep finding new treasures in our area. Elaine D.Where do you live? This top floor apartment, with lift, is beautiful - tasteful decor and sparkling clean. There's everything you could need for making meals and coffee, very convenient shower room/toilet and delightful terrace at the rear. Wifi is fast and reliable and air-conditioning excellent. Restaurants, bakers, supermarkets and places of interest are within easy walking distance on each side of the Vieux Port - all totally convenient. Victor gave us a warm welcome, and it was great to meet his parents,Helene and Roland, at the end of our stay - thank you so much for a wonderful trip - we hope to be back! We have thoroughly enjoyed meeting you and are very much looking forward to hosting you again whenever you choose to visit Marseille. There are so many other corners of our area worth visiting and that we will gladly share with you to fill every of your trip with new discoveries. we stayed one week in this really confortable flay. Everything was as we expected; the flat is very clean,neat and cosy, very true to the pictures.It'svery bright, the bed is very confortable. It's very quiet too, but at the same time so close to the harbour! let's not forget the terrace , we used even though it was February! so as you can understand we really enjoyed our week there and we recommend it. last but not least the owner is very pleasant; she let us stay in the flat until we took our TGV back home . Extremely enjoyable stay at this charming top-floor apartment (with elevator! :-) above the Vieux Port (Old Harbor) central district of Marseille. The balcony views over the harbor are stunning day & night while the large garden terrace at the back of the apartment affords calm & quiet right in the heart of this bustling city center. We loved going to the traditional fish market on the harbor quays in the morning! Many cafes, restaurants, art galleries, shopping options are on its doorstep as well as the Opera House. Walking down the harbor, you will also find within minutes from the apartment the Haussman-designed city boulevards such as Rue de la République with its Paris-style building and many stores & eateries, the recently opened InterContinental in a wonderfully renovated grand landmark building (the city’s former central hospital… if I remember correctly :-), the original and very pittoresque central district known as Le Panier with its Vieille Charité museum and, sitting above the sea at the end of the harbor behind a concrete lace covering the entire structure, the MUCEM museum: both museums are superbly curated and well worth the visit; also the MUCEM is built around an ancient fort that is open to the public for the very first time. The Notre-Dame-De-La-Garde church with its towering gold statue of St Mary sits above the harbor overlooking the city. A top notch location for a very smart apartment that has been carefully renovated and decorated to stylishly incorporate all comfort and mod cons. It definitely made our first visit to Marseille a must-see in a must-stay apartment that we would definitely recommend and book again!